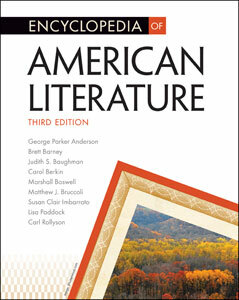 Booklist/RBB "Editors' Choice Reference Source"
Encyclopedia of American Literature, Third Edition is an extensive reference work that spans the entire scope of American literature, from the colonial period to the present. This updated and comprehensive encyclopedia includes entries on writers, works, literary movements, and a variety of other topics. Regionally and culturally inclusive, entries on writers describe key life events, provide thumbnail descriptions of and critical reactions to their works, and discuss the writer's significance in the literary period. Explores America’s literary beginnings and the connections between early American history and the nation’s emerging literary tradition—covering the Puritans and their Bay Psalm Book, the Federalists and the United States Constitution, Benjamin Franklin, Phillis Wheatley, and more. Discusses the writers, works, genres, literary movements, and related historical events of 19th-century America, from the romanticism of Walt Whitman, Nathaniel Hawthorne, and Ralph Waldo Emerson to the realism of Mark Twain, Henry James, and William Dean Howells. Defines the evolution of a new American sensibility and brings the modern literary world alive, with entries on Frank Norris; Stephen Crane; Booker T. Washington; F. Scott Fitzgerald; Zora Neale Hurston; The Virginian: A Horseman of the Plains; Absalom, Absalom! ; and The Waste Land. Examines the emergence of new writers and voices and describes the evolving movements that encompass today’s literary history—covering Deconstruction, the Beats, Toni Morrison’s The Bluest Eye, gay and lesbian literature, New Journalism, science fiction and fantasy, and more. Susan Clair Imbarrato is associate professor of English at Minnesota State University Moorhead. She is author of Traveling Women: Narrative Visions of Early America. Currently, she serves as the executive coordinator of the Society of Early Americanists. Carol Berkin holds a Ph.D. from Columbia University and is a professor of history at Baruch College and the Graduate Center in New York. Her publications include Jonathan Sewall: Odyssey of an American Loyalist; Women of America: A History; and First Generations: Women of Colonial America. Brett Barney is Research Assistant Professor at the University of Nebraska-Lincoln's Center for Digital Research in the Humanities. He has contributed to the Journals of the Lewis and Clark Expedition Online and is Senior Associate Editor of the Walt Whitman Archive. He has written on Whitman and 19th-century popular culture, and he is currently editing a comprehensive edition of Whitman interviews. Lisa Paddock holds a Ph.D. in English from the University of Toronto. She has written scholarly articles on literature for Mississippi Quarterly, Massachusetts Study in English, and other journals. She is the coauthor, with Carl Rollyson, of Susan Sontag: The Making of an Icon, Herman Melville A to Z, and The Brontes A to Z.
Matthew J. Bruccoli has written or edited 100 volumes on American literature and is president of Bruccoli Clark Layman Publishers and Manly, Inc. He is Emily Brown Jefferies Professor of English Emeritus at the University of South Carolina. George Parker Anderson is a senior editor at Bruccoli Clark Layman Publishers and Manly, Inc. He is the principal in-house editor for the documentary series of the Dictionary of Literary Biography. Judith S. Baughman is the author of Literary Masters: F. Scott Fitzgerald, editor of American Decades: 1920-1929, and coeditor of books on Fitzgerald, Ernest Hemingway, John Hall Wheelock, James Dickey, and Nelson Algren. Carl Rollyson holds a Ph.D. from the University of Toronto. He is a professor of English at Baruch College and has written numerous biographies and articles on 20th-century writers, including William Faulkner, Lillian Hellman, Norman Mailer, and Martha Gellhorn. He is the coauthor, with Lisa Paddock, of Susan Sontag: The Making of an Icon, Herman Melville A to Z, and The Brontës A to Z.
Marshall Boswell received his M.A. from Washington University in St. Louis and his Ph.D. from Emory University. He is the author of John Updike's Rabbit Tetralogy: Mastered Irony in Motion and Understanding David Foster Wallace, as well as works of fiction. He currently teaches literature and fiction writing at Rhodes College in Memphis, Tennessee.